The third generation of LBP laser printers utilise the newest 6 and 17 page per minute print engines from Canon. The performance is unrivalled by the competition, whilst incorporating a host of features to improve ease of use and reduce energy consumption. Canon offers you a choice of either the LBP660 with the Windows Printing System, 600 x 300 dpi resolution and real 6 page per minute performance of the Canon AX engine, or for the high - end corporate user, the LBP1760 with 1200 dpi resolution and 17 page per minute 52 engine. The Canon LBP660 Laser Printer. The LBP660 provides outstanding print text quality, approaching that of a 2400 x 600 dpi printer, using "Automatic Image Refinement" (AIR), "Superfine Toner" and "Fuser On Demand" technology. AIR varies the size of the dots near the image edge by placing smaller dots in the space between the standard dots, thus improving definition and enhancing reproduction. The improvement in print engine resolution is assisted by "Super Fine Toner". This development pioneered in the last generation of Canon laser printers uses toner particles a fraction the size of conventional particles. Finally, "Fuser On Demand" not only helps lower energy consumption, it produces blacker blacks and better half - tones. As an added bonus, this revolutionary technology results in a printer that uses 67% less power in operating mode as compared to conventional laser printers. Heat production is so insignificant that the requirement for a noisy cooling fan has been eliminated, making the LBP660 the ideal choice for a quiet office. A special "Standby Mode" reduces power consumption to a meagre 3.5 watts. When left in standby mode for more than 15 minutes, the printer automatically enters "Sleep Mode". Another advantage to "On Demand Fusing" - when you are ready to print, there is no warm - up delay and no waiting. 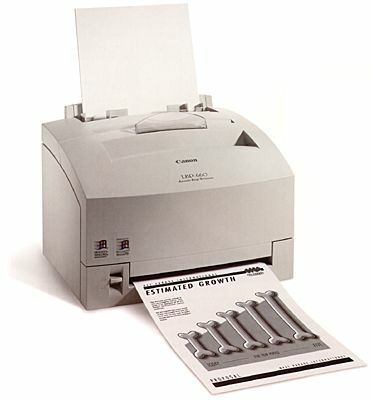 The Canon LBP1760 Laser Printer. The LBP1760 workgroup printer is the perfect choice for a busy office. With a 17 page per minute 52 engine, it can cope with the largest job (rated throughput of 65000 pages per month). The 600 dpi base text resolution is supplemented by Automatic Image Refinement, producing remarkably clean text with the equivalent of resolution of 2400 x 600 dpi. When printing graphics the base resolution improves to 1200dpi. Other great features include a 500 sheet paper cassette as standard, 45 in - built microtype fonts, and 4MB RAM, expandable to 32MB if required ! Optional extras include a duplexer, allowing full double sided printing, (think of the paper and time savings!) a 500 sheet paper tray and envelope feeder. ZCM Services can also supply the FULL RANGE of consumables for all current and superseded Canon Laser Printers. These items also fit a lot of other manufacturers' printers, since they use an identical Canon engine. (eg: Hewlett-Packard, Apple, DEC and Gestetner) Please contact ZCM Services if you require assistance choosing the correct component for your printer. A $12.00 delivery fee is payable for consumable orders not purchased with a new printer. Remanufactured toner cartridges are also available for this range of printers. Please click here for further information. Copyright ©1997 ZCM Services, Australia. Last updated on November 23, 1998.